A cabside number-plate from loco no. 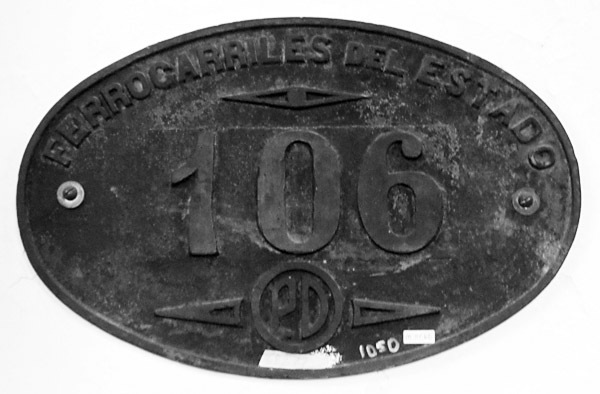 106, showing the PD (Puerto Deseado) logo within the circle at the bottom of the plate. The identity of loco 106 is not yet known. Cyls. 500x630mm; BP 12kg/sqcm; dr. wheels 1,600mm, carrying wheels 850mm; length 11,090mm (loco only). Minor differences between different batches - eg. Maffei locos had Belpaire fireboxes. This loco was exhibited at the Argentine Centenary Exhibition in May 1910 before delivery to FCE. Only 3 H. St. P locos recorded in 1912?, though engineer's report in December says 4. Operating in 1945 & '56, ’57 & ’60. Transferred away by 1934, possibly to San Ant (JP). destination uncertain. However, 3 Cockerill 'pacifics' recorded here in 1912, and 2 in Dec 1912 engineer's report. Transferred to San Ant. by 1934, but working here again in 1956 & 57 and under repair here in '60. Ex FC Andino 0-6-0T no. 2. Purchased by FCE in 1909, at a price of $oro 3,718. Present in Dec 1912. Present in 1934 & ’45 & '56 but not in use. Dimensions of a 4 axle tender given at that date. Originally named 'Talleres'. Ex FC Andino 2-6-0/4-4 nos 4-5. Purchased by FCE in 1909, at a price of $oro 9,901 each. Cyls. 18 x 24", dr. wheels 4' 6". Ex T. Carlisle contractor, ex FC Sud from 1896 (BAGS) 0-6-0T. Class 2C no. 38. Purchased by FCE in 1910 for abour $oro 6,000. 30 or 68.5 inc. tender etc.? Present in Dec 1912. Present in 1934, ’45, '56 & ’57. Dimensions of a 3 axle tender given in ’45 & ‘57. Ex FC sud (BAGS) 4-6-0/2-4. Class 7C nos. 162-3. (Originally from FC de Buenos Aires y Puerto de la Ensenada, or FC BsAs Ensenada & South Coast?, nos. 13-14, later R/N nos. 32-33) Purchased by FCE in 1910 for about $oro 6,000. Built by Sharp Stewart in Manchester 1885. Cyls. 457x610mm (18 x 24"); dr. wheels 1.37m (4' 6"), carrying wheels 0.81m; haulage 1,865 ton on flat, 228 ton on 1 in 50. Only one of these locos recorded in 1912 report at Pto Deseado, but another SS loco from BAGS is listed as at San Antonio. Dec 1912 report also says only 1 at PD. Pto. Deseado drawings book of 1912 preserved in archives at Retiro also records only loco 163. Ex Central Argentine 2-6-0/6. Class M1A no. 424. Purchased by FCE in 1909 for about $oro 6,000. Cyls.17/24 1/2 x 24, dr. wheels 5' 2"
Ex Central Argentine 4-6-0. Class C2A nos. 610 and 614. Purchased by FCE in 1910. Orig. ex C&SFGS nos 26/30, then BAR nos.141/145, then CAR. These locos not recorded in first 1912 report, but were present by Dec 1912 engineer's report. Pto. Deseado drawings book of 1912 preserved in archives at Retiro shows both locos. 4-6-0 ex Buenos Aires & Pacific Railway. Class 1201. Cyls. 495 x 660mm/19.5 x 26 inches; Dr. wheels 1702mm/5' 7"; BP 12kg/cm2; TE 9945kg. Nos. arriving at Puerto Deseado not known. Arrived late '50s or early '60s, not present in 1956. Nothing known about identity of loco, except that an FCE number-plate with the PD logo (Pto. Deseado) is mounted on a wall in the Retiro railway museum. Drewry railcars, ex FC General Roca ex FC Sud. Length 14.40m; 39 seats clase unica; tare 26 tonnes. Locally built railcars, 2 axle. Length 8.20m; 32 seats clase unica, Tare 8.70 tonnes. Much data in this table initially from Reg Carter's lists. Railways of Argentina. 46 Mill St. Kingston upon Thames, Surrey, UK. also from FC Genl. Roca reports of 1973 and 1975 in Hector Briano's book 1999. Confirmation of locos on the line in 1912 is from Memoria del Ministerio de Obras Publicas de la Nacion Correspondiente al año 1912/13, Capitulo II, Anexo L. Confirmation of locos present in 1945 is from the appendix to the working timetable ('itinerario'), as kindly scanned and forwarded by Señor Sergio Barral. 1957 details similarly are from the appendix to the 'itinerario'. 1956 details arte from an FCE data sheet for Pto. Deseado. Loco dimensions are from Edgardo Somoza's paper Las Locomotoras del Ferrocarril de Puerto Deseado a Nahuel Huapi in Hector Briano's book 1999, and from the 1945 appendix. An FCGR document from 1974 states that there were nine locomotives still on the books at that point, two in service, two 'radiadas' or dismantled, and five awaiting repairs. Unfortunately no running numbers are given.